Y’all know I love me a good dupe. Who doesn’t? I have an appreciation for all makeup, and I don’t care if it’s drugstore or high end. If it performs amazing, that’s all that matters to me. I was recently sent a press package from Cover Girl and tried on one of their new matte liquid lipsticks. Immediately upon application, I thought, “Hmm… this reminds me so much of Koko K!” So I pulled out my Kylie lipstick and swatched it. Y’all, we have a Kylie Cosmetics Koko K dupe! But wait, there’s more. One more, to be exact. I was digging through my lipstick collection and saw another Kylie Koko K dupe! I’ve got to share both of them with you because they’re that good! Have you ever tried a Kylie Cosmetics lipstick before? The packaging is so pretty and I love the shades and formula. I do love the product and definitely would repurchase. 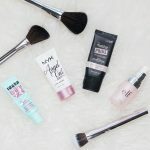 However, if you are looking to save, I definitely think these two dupes are worth checking out! The dupe I found is the new CoverGirl Melting Pout Matte Liquid Lipstick in Ballerina. I was able to find it on Amazon Prime for you guys, and there is currently a $1.00 off coupon you can use on it! This makes the price a lot lower than what you’ll see in your local drugstores. Here’s a side-by-side comparison of Kylie Cosmetics Koko K vs. CoverGirl Melting Pout Matte Liquid Lipstick in Ballerina. And here are some lip swatches of the two products. How do you think they compare? Formula: Applies very similarly, but you need a good second swipe to get the full coverage you probably want. This is not a deal breaker for me! I really enjoy the formula of the lipstick. It appears a bit more “shiny” in the photo (the best word I can come up with to describe what I’m seeing), but in person this lipstick looks matte. Color: If you are super picky about tones and color, you may disagree that this is a dupe. The CoverGirl lipstick is slightly more warm-toned. I feel that the color difference is so slight, only the most sleuth makeup aficionados would notice. Wear: I feel they wear exactly the same. I do not notice this wears off any longer or shorter than the Kylie lipstick. I’m calling this a dupe because it is so similar. This second dupe is a little more affordable (same price on Amazon) and is the Jordana Sweet Cream Matte Liquid Lip Color in Creme Brulee. You should be able to find this product in Walgreens stores for $4.99, but if you do not want to risk it, go ahead and order it as an add-on item for Amazon prime. Here’s a side-by-side comparison of Kylie Cosmetics Koko K vs. Jordana Sweet Cream Matte Liquid Lip Color in Creme Brulee. Here are some lip swatches of the two products. It’s strange how the swatches on my arm look almost identical but slightly different on my lips! I wonder if my camera settings were different or it was more cloudy outside when I took the Jordana picture. In real life, I think these look even more identical than the CoverGirl one! Formula: Applies almost identically, and even has that same vanilla scent to it. It dries down completely matte. Color: I think this shade is even more similar than the CoverGirl lipstick! I’m super impressed by how nearly identical they look. Wear: I do find that this one gets the most “crumbly” out of the three lipsticks and wears the least longest out of the three lipsticks I’m talking about today. That’s not a deal breaker for me. I really think you can’t go wrong with either “dupe” lipstick, but if you are in Walgreens and see a Jordana display, definitely pick up that one first. If you’re ordering on Amazon, pick up the CoverGirl lipstick because it’s more affordable! Be sure to check out more of my blog posts where I have duped many products! I’m always here to save you a little money. 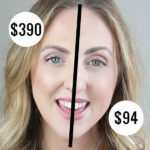 Do you like finding dupes to your favorite high end makeup products? What should I try and find a dupe for next? NYX Micro: Anastasia Brow Wiz Dupe?